Need a great gift for Valentine’s Day? We’ve got you covered | Community Living Inc.
Valentine’s Day is just over a month away. If you aren’t sure what to get for your special someone, don’t fret — we’ve got you covered! For as little as $3, you can enter to win a $25 gift card at The Candy Kitchen, and $30 in gift cards to Frederick Florist. You can’t go wrong with candy and flowers on Valentine’s Day! For just $5 a ticket, you can enter to win a couple’s adventure at Clue IQ, an escape room right here in Frederick. And, for only $7 a ticket, you can try your hand at winning a couple’s photo shoot courtesy of Leigh Anne Brader Photographyvalued at $260! Or, for $10, you can enter for all three! See flyer for dates and details! 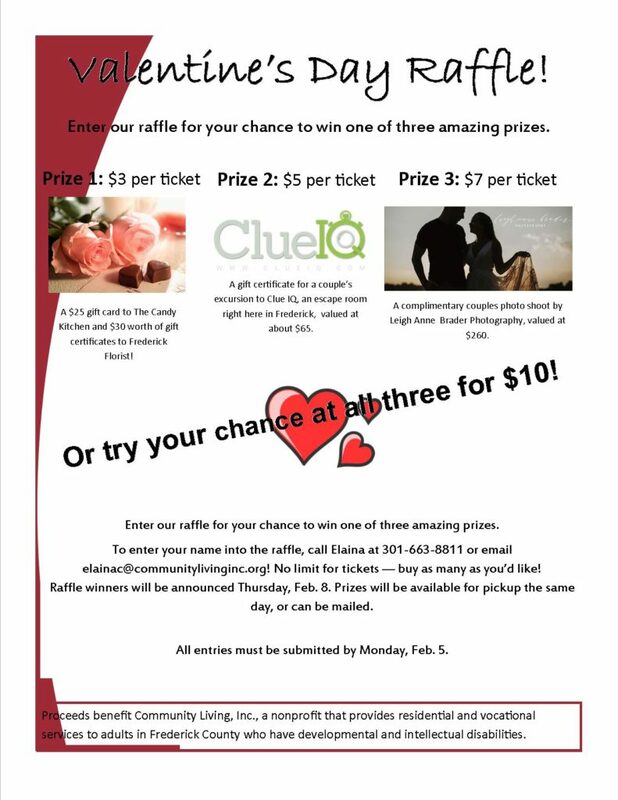 For more info, or to enter the raffle, contact Elaina via email or phone at 301-663-8811.